I think I’m finally coming out of this crazy illness that I’ve had going on. I’ve been feeling pretty run down and tired and unable to get out of bed, for the most part. I AM getting out of bed sometimes, just not really wanting to because my stomach is typically killing me. My chin is healing. It turned green and yellow and caused a few people to laugh about how it’s a good thing Jon’s in Brazil (which I vehemently disagree with. I WANT HIM HOME NOW). 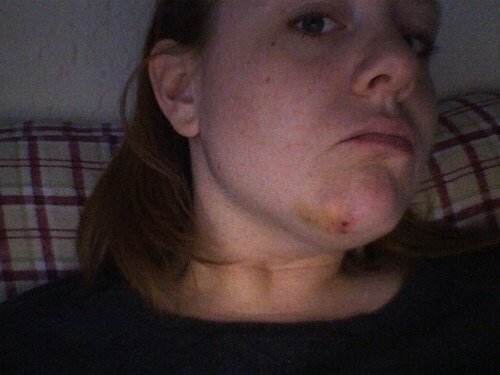 It wasn’t too big a deal, though – and it’s mostly (visibly) healed/gone now. I had a session with the trainer on Tuesday, but I came home and went right back to bed – yeah, I have never canceled. Today? I worked until 11 and then bailed and came home and went to back to sleep. I HATE being sick. I’m a whiny baby, for sure. My goal for tomorrow = work all day, trainer, pilates later tomorrow night and food other than ginger snaps and ginger ale.